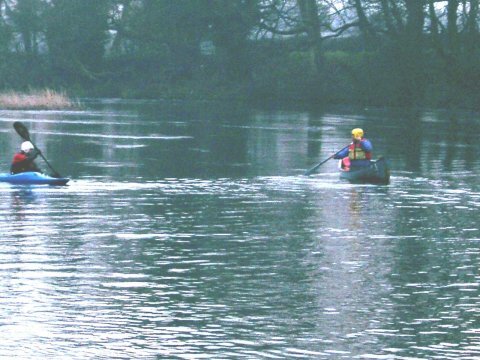 The Teesdale and Weardale Search and Mountain Rescue Team (TWSMRT) Canoe Group assist the TWSMRT with searches (and occasionally rescues) in or near water throughout County Durham. Accessing the water by boat allows inspection from a different perspective and rapid access to sections of bank side not easily reached from elsewhere. Furthermore it also allows much better searching of the water itself. The Canoe Group also help in flood conditions to access flooded areas which cannot be reached safely by other means. Searching rivers for missing persons is the main part of the canoe groups work - it is not usually technically hard water but is quite demanding on the concentration (and usually cold and smelly). Call outs are by their nature unpredictable but often seem to happen mid week. All members of the canoe group are local paddlers and volunteers. Live in or near the Durham watershed (e.g. Tees, Wear or Derwent). It is also an advantage if canoe team members have their own transport and an email address for day to day communications. Unfortunately for insurance purposes non canoe team members may not help on call outs.